Last updated: Dec 8th, 2010. Long before the Nexus One launched, the media was filled with speculation, buzz, rumors, and excitement regarding the possibility of a "Google Phone". 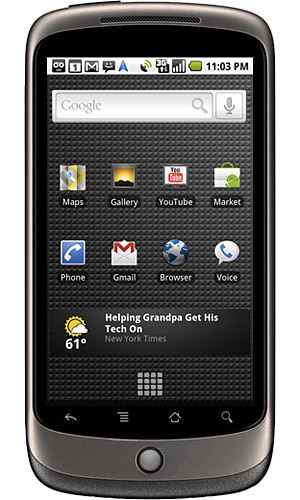 The rumors were put to rest when Google announced the Nexus One, the first ever Google Phone. Although the company never officially dubbed it the gPhone or Google phone, thta's exactly what the Nexus One is, and it's the first of its kind. The Nexus One is a high end superphone which packs a whopping 1GHz Snapdragon processor , 5MP Camera and large 3.7-inch AMOLED screen for quality viewing. Being Google's phone and made by HTC you can expect a quality handset and thats exactly what you get with the N1. An additional feature sure to raise an eyebrow is its good looks, with a light & dark grey casing that is teflon coated. 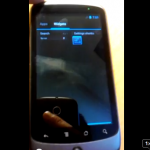 The Nexus One is the first ever Andorid phone to have Android 2.1! 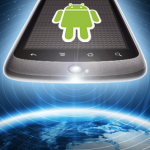 (Eclair) and was also the first to get Android 2.2 (Froyo). 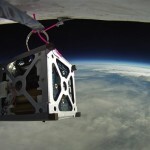 This ushered in a new era of Android that included many new features, including Live Wallpapers, animated backgrounds. 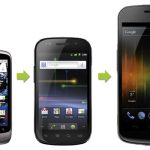 Perhaps the biggest "first" that the Nexus One brough about was in distribution: the Nexus One was made available through Google's website and ONLY Google's website, a a bold move which Google has since backed away from. 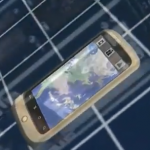 The Nexus One was originally leaked under the codenames HTC Dragon and HTC Passion. There’s still some bad blood between HTC and Samsung dating back to 2010 when Samsung pulled their AMOLED displays from the Nexus One and HTC Desire.